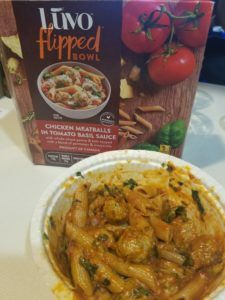 Disclaimer: I received an assortment of Luvo Flipped meals to review as part of being a BibRave Pro. Learn more about becoming a BibRave Pro (ambassador), and check out to review find and write race reviews! Most of my loyal followers know that I love to get in the kitchen and cook. I’d love to be able to prepare fabulous healthy meals, ALL THE TIME, using fresh ingredients that were grown locally. But we all live in the real world, and I don’t know anyone with time like that! 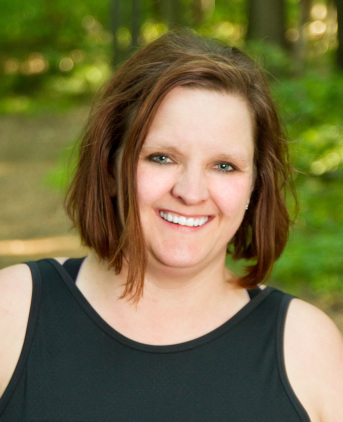 So, unless I give up working, stop working to build my business, give up interacting with family and friends and maybe even stop running (ok who am I kidding, I’ll never stop running! LOL) there are just not enough hours in the day to do everything AND spend that much time in the kitchen! 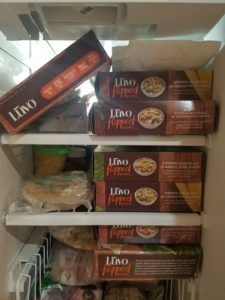 Thankfully Luvo has introduced a new line of frozen meals to help me with healthy meals when time is not on my side! The bowls are called “flipped” because Luvo is adding a new twist on familiar flavors, specifically incorporating more protein from plants! Luvo is founded on the idea that food should be nutritious AND delicious! You should not have to sacrifice quality for convenience! With Vegan, Vegetarian and Gluten Free options available, there is something for everyone. I will be honest, when I first read about these meals, I was skeptical. How could something frozen be THAT good? But then I started doing more research and was excited about what I saw! All of their meals are packed full of protein, whole grains and veggies! They are full of everything you (and your body) need, and nothing that you don’t! The day that I received my shipment, I was just about to head out to run some errands. But I hadn’t eaten lunch yet. I unpacked my box and decided that errands could wait. I was eating lunch early! Once I decided which on to try first, I packed 7 of the meals in the freezer, and got ready to eat! I opted for the Tomato Basil with meat sauce as my first Luvo adventure. Upon reading over the box, I was excited to see both microwave as well as oven cooking instructions. I don’t use my microwave often and will usually use the oven for cooking whenever I can, but sometimes you just need something quick. That was today. I had stuff to get done and didn’t want to wait! 3 1/2 minutes later, I had a steaming bowl of pasta that I had to let cool off for a few minutes so I didn’t burn my mouth! As I waited for lunch to cool off, I started reading more of the info on the box. With only 300 calories but packed with 17g of protein, 17g of whole grains and 31g of vegetables it is the perfect go to lunch on the go for me! Once I was able to dig into lunch, I was hooked. I had a new go to option for a quick and easy, healthy lunch! 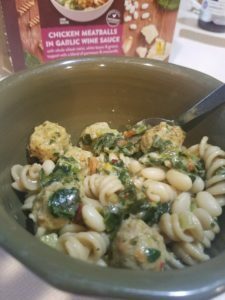 The balance of flavors was perfect but the best feature to me was the chicken meatballs! I normally find frozen, microwavable meals with meatballs (or almost any type of meat) to be less than appetizing. They are usually either tough or mushy (nothing in between) and lacking flavor. These were the perfect size and texture and the flavor was spot on! These were frozen meatballs that I would buy to add to my own favorite recipes! Hey Luvo? Can you hook a girl up with a bag of these meatballs!?!?! I would to add them to my own creations, but at the same point, I could eat them just as they are, with just a little sauce on top! Over the last few weeks, I have tried each and every one of my meals. There is no way that I could pick a favorite! The Tomato basil one was awesome, but the Pasta with Garlic Wine Sauce was AMAZING! As I mentioned before, these come with quick and easy microwave instructions as well as oven directions. I have cooked them both ways and can say that not matter which cooking method you choose, the quality stays the same!! No mushy pasta, no rubbery meatballs and the mix of cheese and veggies mixes together perfectly! Everything is shipped on dry ice so that it can get from their warehouse to you! I will admit that I did have a slight mishap with shipping (my order was shipped at the same time they were switching shipping companies) and that caused some slight issues, but that they bent over backwards to ensure that they made it right. They proved to me that they care about what they are selling, the quality of the food and making sure that each and every customer is taken care of and receives a high quality product shipped directly to their door! Now, if you live in a warmer climate, I’d still try to make sure that your shipment is not sitting out on a warm porch all afternoon – remember these are frozen entrees and should be transferred to the freezer as soon as possible. Thankfully, I was home on the day that my order was shipped as it was one of those rare 90+ degree days here in WI! Want to try the Flipped Bowls for yourself? Head on over to LuvoInc.com and order your own today! Use the code BIBRAVE at check out to buy 7 meals and get the 8th FREE! This is valid on all of there frozen lean options, not just the new Flipped ones!! ⟵When you want to Go Far, go to Fargo! Nice review! I also like this excerpt: “…maybe even stop running (ok who am I kidding, I’ll never stop running! LOL)” I think a lot of us can relate!! Yeah, it’s gonna take a lot more than that to get me to stop running!